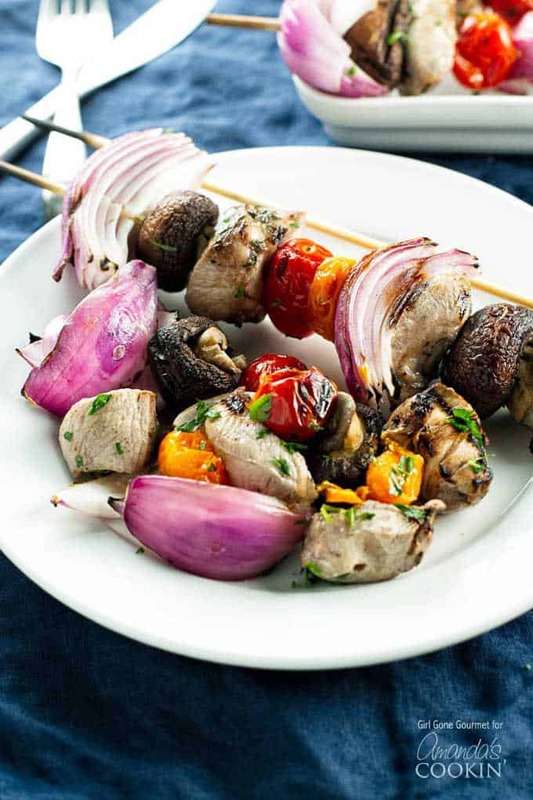 Summer wouldn’t be complete without tender, juicy marinated grilled chicken and flavorful mixed vegetables threaded onto skewers and enjoyed by all. 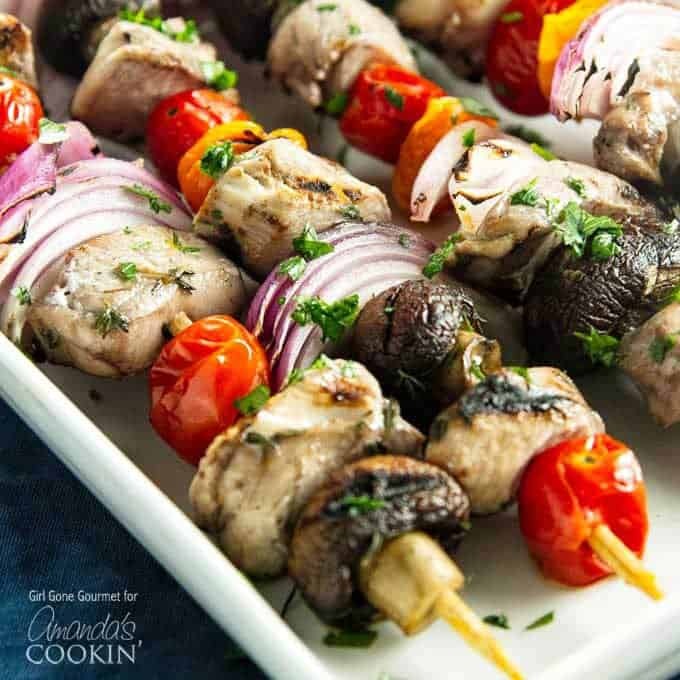 These chicken kabobs are anything but ordinary thanks to a rule-breaking marinade that takes no time at all to mix up. Summertime grilled skewers just got a whole lot more interesting. Some rules are just meant to be broken. In my mind, wearing white after Labor Day is totally fine, sitting too close to the TV hasn’t made me go blind, and red wine isn’t just meant for beef. When it comes to cooking it’s easy to get stuck on “what’s right” and the whole white wine with chicken and red wine with beef rule is the perfect example. So let’s break some rules, shall we? 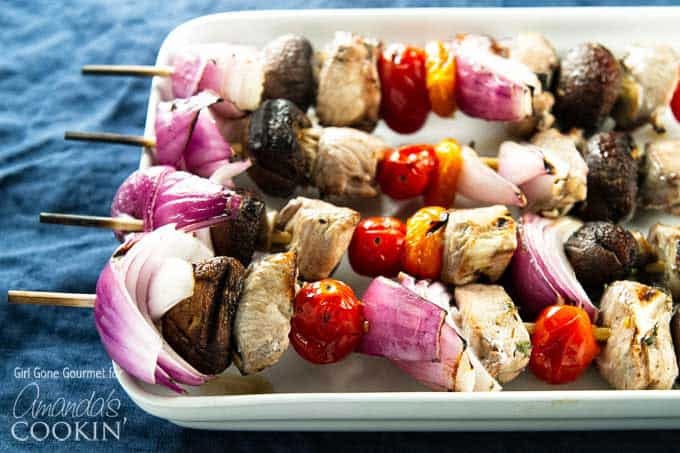 In our house, summer is synonymous with grilled kabobs – we just can’t get enough of them. I love them because everything is cooked on the grill saving me from an overheated kitchen on a 95 degree day. They’re also a one-stick meal with everything you need (tender chicken and vegetables) served all together making these an easy weeknight dinner or a main course for a crowd. I mean, who doesn’t love food on a stick? Since we eat a lot of these I like to come up with new fan-dangled marinades to keep it interesting. Tradition says to use a lovely chardonnay or pinot grigio as the base for a chicken marinade, which is fine and delicious, but also predictable. To switch things up I first closed the kitchen shades lest anyone saw what I was about to do and I mixed up a red wine marinade with a touch of honey, fresh herbs, and garlic. The chicken got a good 30-minute soak. It felt totally scandalous. After a quick cook on the grill this marinated grilled chicken turns out tender and juicy with a hint of fruitiness thanks to the red wine. It’s a surprising pop of flavor that leaves everyone wondering about the secret ingredient. Now, whether or not you share it is up to you. So what are you waiting for, rebel? It’s time to break some rules. You’ll thank me later for showing you this Chile Lime Chicken recipe. 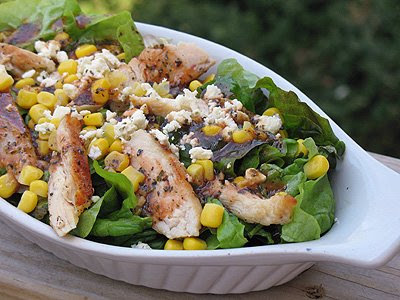 It’s full of flavor and always a hit with the family. 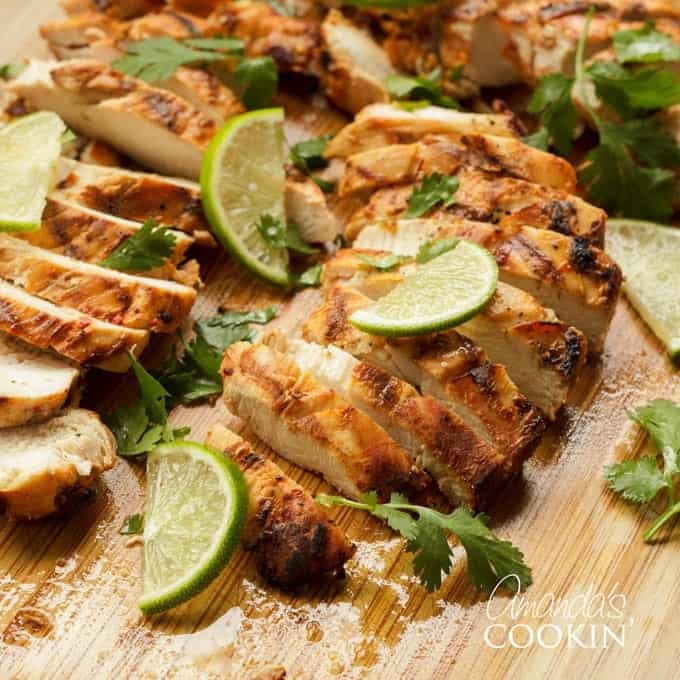 When it comes to marinated grilled chicken, this cilantro lime chicken for the grill is one of my all time favorites. 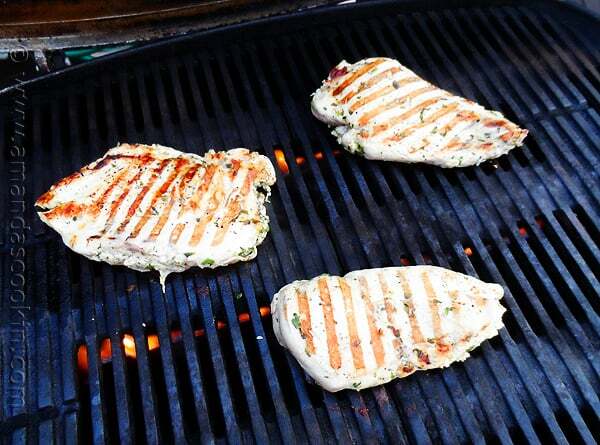 If you love cooking on the grill, you definitely should try these super simple grilled garlic lemon chicken breasts. If you have any leftover marinated grilled chicken like I often do, this grilled chicken salad with herbed tomato vinaigrette is delicious! 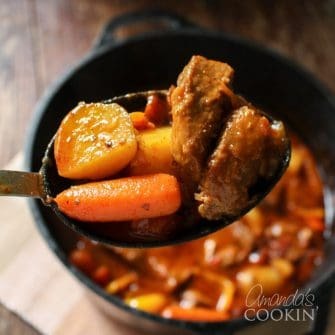 Want even more free recipes? Be sure to subscribe to my newsletter for FREE recipes and craft ideas sent to your inbox every week. Juicy chicken marinated in a flavorful red wine marinade and then grilled with fresh vegetables. This is a summertime go-to favorite. Combine the wine, 1 teaspoon of thyme, olive oil, honey, garlic, Worcestershire sauce, salt, and pepper in a large resealable bag. Add the chicken, seal the bag, and sort of squeeze the bag to get everything mixed together and well coated. Place the bag in the fridge for 30 minutes, flipping it once half-way through. Preheat the grill to high heat. 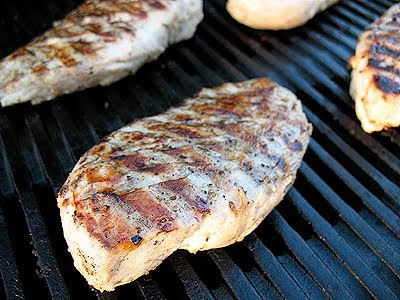 While the grill is pre-heating, remove the chicken from the marinade and place it on a few paper towels. Blot the chicken dry (this will help it sear better on the grill). Take a skewer and thread a mix of the veggies and chicken. Repeat with the remaining skewers. Grill the skewers for 6-8 minutes, or until the chicken is cooked through. Turn them once or twice while they are grilling to maximize char marks all sides. Remove from the grill and serve hot or at room temperature. I recommend using a Pinot Noir for this recipe, but any medium-bodied red wine will work fine. What's most important is that you choose a label that you like to drink, otherwise you won't be happy with the results. I prefer wooden skewers, but metal skewers will work fine (and you don't have to soak them!). Just be careful on the cook time since metal skewers conduct more heat and will cook the chicken faster. April lives in North Carolina and is a busy professional by day and passionate home cook by night. 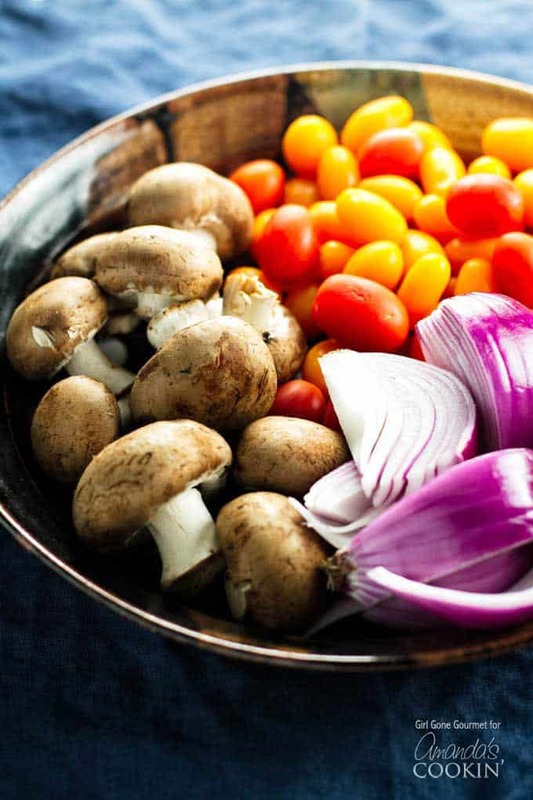 In 2009 she created Girl Gone Gourmet, a food and recipe site, for people who love to cook delicious dishes using simple and accessible ingredients. She loves comfort food, wine, travel, and Feynman, her 70-pound golden retriever puppy. Follow April on Pinterest, Instagram, Facebook, and Twitter. Hi Judy! I’m sorry for the confusion! Thank you for leaving a comment – the amount of fresh thyme should be 1 teaspoon and all of it should be included in the marinade (the recipe will be updated to reflect this soon). If you are using dried thyme, reduce the amount to 1/4 teaspoon. The recipe calls for 2 teaspoons of fresh thyme leaves, divided.The first tsp goes in the marinade. But I don’t see what you use the second tsp for. What is missing? Also, could I use dried, ground thyme in a lesser quantity instead?